1 Can Cranberry Sauce, Whole Berry, 16 Oz., Nt. Wt. 1. Preheat the oven to 500 degrees. 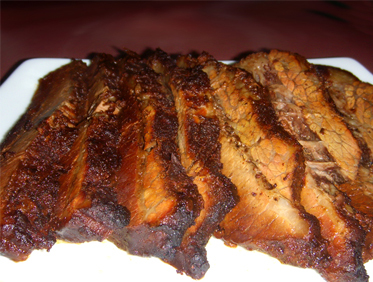 Remove the brisket from it's package, rinse, and wipe dry. Trim off most of the fat, including the membrane that's right beneath it. 2. Dump the Blacken on top, then the dark brown sugar. Rub it into the meat real well, including the sides. Place the brisket into the oven, uncovered at 500 degrees for 15 minutes. 3. While the meat is in the oven, open the cranberry sauce, place it in a pot, and break it up a little. Add the rum, and heat over medium heat just until the jelly is melted. 4. After 15 minutes in the oven, the meat will have a nice crust on it. Take it out of the oven and pour the cranberry sauce over the top and sides of the meat. Cover it tightly with aluminum foil, place the pan back in the oven, and turn the heat down to 300 degrees. This slow cooking will break down the collagens in the meat, making it tender. Cook for another 2 1/2 hours. 5. Take it out of the oven, let it cool, then refrigerate in the same pan overnight. 6. The next day, preheat the oven to 325 degrees. You'll notice that the fat has risen to the top, and become quite hard. remove this fat with tongs. Don't be too concerned with getting every last bit of fat out, because it really won't matter. Slice the meat into 3/8" - 1/2" thick slices. 7. Place the pieces back into the pan trying to recreate the shape of the meat. Pour an additional cup of Cranberry juice, Apple Juice, Orange juice, etc. into the pot to increase the amount of liquid. Cover tightly with aluminum foil, and bake for another 2 hours. 8. When it's done place the meat on a platter, and pour the drippings into a gravy boat. We didn't feel that there was any need to thicken the drippings, because, being thin, they added to the flavor and moistness of the meat. 9. I served this with Potato Salad, Corn Bread, and additional Cranberry Sauce.